Fawad Khan sprung on to the Bollywood scene with Khoobsurat and confirmed his position with Kapoor & Sons. But what set him apart from the rest of the actors really fast was his dressing sense. Quickly becoming a stylist's dream and GQ beloved, his own personal style is on point. 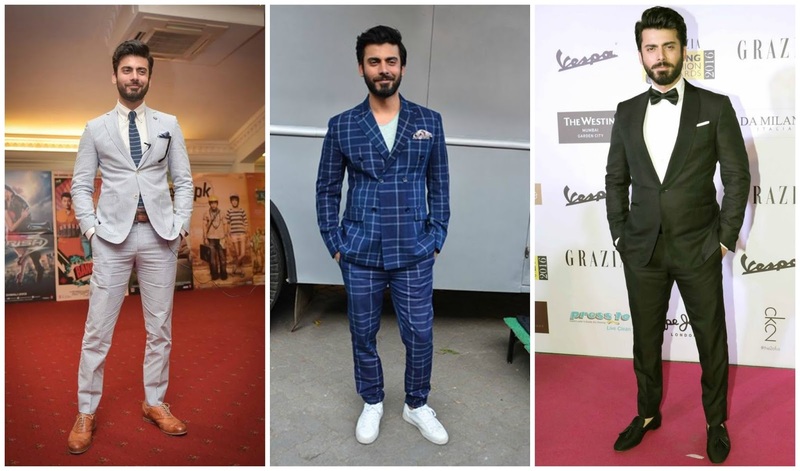 While the quirky and eccentric men can get their style inspiration from out-of-the-box-style icon Ranveer Singh, Fawad presents a more Sartorial, dapper, put together look for the average male to strive towards. His style of dressing has also become a key part of his brand which includes his perfected beard and deep, brooding and sensitive eyes, making him the ultimate romantic actor Bollywood has to offer. But we can't forget that it all started in Pakistan for him and that is also where he has started his own women's clothing line with his wife called "Silk by Fawad Khan." I won't hold back, if i'm completely honest Fawad has had my heart since I saw him first in the phenomenon Humsafar back in 2011 and I'm happy with his incredible reception in India, as he is not only a good looking face he is a seasoned and unique actor deserving all the positive attention he has been receiving recently! Check out our previous Style File posts!